Shipping is $7.00 to ANYWHERE in the United States or Puerto Rico via USPS Priority Mail. If you buy more then 1 set at a time, each additional will only be $4.00 for shipping! This brand new carbide tipped drill bit set is great for use in any Quality rotary hammer percussion drill that uses the SDS Drive or SDS PLUS Drive system. Bosch, Makita, Hilti, Milwaukee and Dewalt all use this system in there small to medium size drills . They will NOT work in drills that have the SPLINE Drive or SDS MAX Drive systems. Nor will they work in really cheaply made hammer drills that use standard round drive masonary bits. These bits are specifically made to work on a handful of makes & models so be sure your drill either says SDS or SDS PLUS!! If your not sure if they are made specifically for your drill, just ask me! 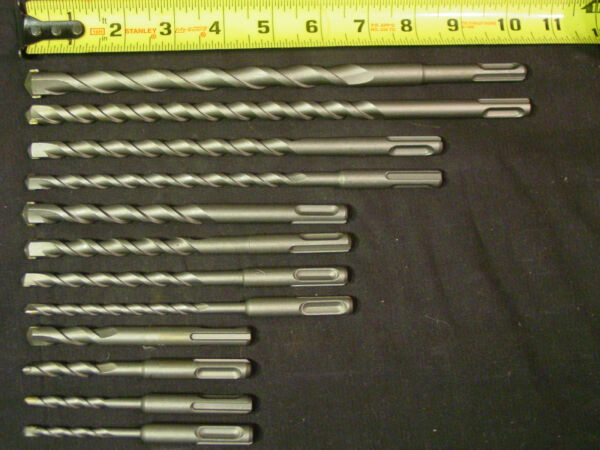 Drill Bits included are: 3/16" x 4 1/4", 1/4" x 4 1/4", 5/16" x 4 1/4", 3/8" x 4 1/4", 1/4" x 6 1/4", 5/16" x 6 1/4", 3/8" x 6 1/4", 1/2" x 6 1/4", 5/16" x 8 1/4", 3/8" x 8 1/4", 1/2" x 10 1/4", 9/16" x 10 1/4"
D25012K, D25023, D25023K, D25101K, D25103, D25113, D25203, D25213K, D25213KR, D25223K, D25303, D25304K, D25304K, D25313K, D25323K, D25324K, D25330K, D25404K, D25404KR, DW567. These bits will fit MANY other makes and models. If you are not entirely sure if they will fit your drill, PLEASE email me with your drills model number and I will be more then happy to look it up for you right away!